In my article on Hans Reichel’s Daxophone, I happened to mentioned the glass armonica, and to promise that instrument an article of its own. That day has come, and I present to you a brief history of the glass armonica. Recall that the Daxophone and the musical saw are “friction idiophones,” meaning sound is produced by rubbing. The glass armonica may be less common these days than either of those comparatively rare instruments, but you’ve all heard something of the sort if you’ve ever daubed your finger in a wine glass and rubbed the rim. People have been doing that for as long as there have been wine glasses, and before there was the glass armonica, there was the glass harp. Also known as the angelic organ and the ghost fiddle, the glass harp is what you get when you tune a number of wine glasses, either by grinding them like bells or filling them with varying levels of water, and let a talented musician have a go. Irish musician Richard Pockrich is considered the instrument’s inventor and first virtuoso. Thanks in part to him, the glass harp was popular by the mid-eighteenth century. Not content with a successful musical career, Pockrich also ran for Parliament, prophesied the development of metal-hulled boats, and promoted the belief that life could extended indefinitely through the use of blood transfusion. He died in a coffee house fire in 1759. Leaving Benjamin Franklin to carry the instrument forward. In 1758, Franklin saw a performance by a glass harp artist and was inspired to perfect the design. Three years later, in collaboration with an enterprising glass blower, he produced the first glass armonica. Instead of an array of glasses, Franklin arranged a series of thirty-seven glass bowls horizontally on a spindle. The spindle was turned by means of a foot pedal, much like a sowing machine. This left both hands free and placed the bowls close enough together to engage all ten fingers at once, a technique not possible with even the cleverest glass harp arrangement. The rims were colour-coded by note, and Franklin suggested playing them with chalked fingers, just as violinists would rosin their bow. Europe loved it. Beethoven, Haydn, and Mozart, among others, wrote works for the glass armonica, and Marie Antoinette started taking lessons. Franz Mesmer incorporated it in his practice of mesmerism. The instrument’s popularity proved shortlived, however, after rumours began to circulate that the seemingly-heavenly sound of the glass armonica drove both performer and audience insane. 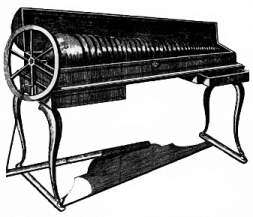 Spasms, melancholy, and miscarriages have all been attributed to the malign influence of the glass armonica. Method books of the period advise against playing when one is upset or otherwise off-balance. The instrument was shunned, and in some cases banned. Scientists have attempted to explain the phenomenon by noting that the frequencies produced by the armonica fall within a range which is difficult for the human ear to place spatially in a room, which some may find unsettling. Although still relatively quiet and damnably fragile, the glass armonica's reputation is beginning to improve. It has appeared on numerous soundtracks and on albums by artists such as Tom Waits, Pink Floyd, and Björk. Perhaps the most prominent of contemporary players is French artist Thomas Bloch, who by no coincidence is also the most prominent player of the Cristal Baschet and ondes Martinot. I’ll let you investigate those later – better get listening to the glass armonica... if you dare.